This article is about the series. For the video game of the same name, see Tiny Toon Adventures (video game). Tiny Toon Adventures is an American animated comedy television series that was broadcast from September 14, 1990 through December 6, 1992 as the first collaborative effort of Warner Bros. Animation and Steven Spielberg's Amblin Entertainment after being conceived in the late 1980s by Tom Ruegger. The show follows the adventures of a group of young cartoon characters who attend Acme Looniversity to become the next generation of characters from the Looney Tunes series. The pilot episode, "The Looney Beginning", aired as a prime-time special on CBS on September 14, 1990, while the series itself was featured in first-run syndication for the first two seasons. The final season was aired on Fox Kids. The series ended production in 1992 in favor of Animaniacs; however, two specials were produced in 1994. Tiny Toon Adventures is a cartoon set in the fictional town of Acme Acres, where most of the Tiny Toons and Looney Tunes characters live. The characters attend Acme Looniversity, a school whose faculty primarily consists of the mainstays of the classic Warner Bros. cartoons, such as Bugs Bunny, Daffy Duck, Porky Pig, Sylvester the Cat, Wile E. Coyote and Elmer Fudd. In the series, the university is founded to teach cartoon characters how to become funny. The school is not featured in every episode, as not all of its storylines revolve around the school. Like the Looney Tunes, the series makes use of cartoon violence (e.g. anvils falling on someone, liberal use of explosives) and slapstick. The series parodies and references the current events of the early 1990s and Hollywood culture. Occasionally, episodes delve into veiled ethical and morality stories of ecology, self-esteem, and crime. The series centers on a group of young cartoon characters who attend a school called Acme Looniversity to be the next generation of Looney Tunes characters. Most of the Tiny Toons characters were designed to resemble younger versions of Warner Bros.' most popular Looney Tunes animal characters by exhibiting similar traits and looks. The two main characters are both rabbits: Buster Bunny, a blue male rabbit, and Babs Bunny, a pink female rabbit not related to Buster, Plucky Duck, a green male duck, Hamton J. Pig, a pink male pig. Other major characters in the cast are generally nonhuman as well. These include Fifi La Fume, a purple-and-white female skunk; Shirley The Loon, a white female loon; Dizzy Devil, a purple tasmanian devil; Furrball, a blue cat; Sweetie Pie, a pink canary; Calamity Coyote, a bluish-gray coyote; Little Beeper, a red-orange roadrunner; and Gogo Dodo, a zany green dodo. Two human characters, Montana Max and Elmyra Duff, are regarded as the main villains of the series and also are students of Acme Looniversity. As villains, Elmyra is seen as an extreme pet lover while Montana Max is a spoiled rich brat who either owns lots of toys or polluting factories. Supporting characters included Li'l Sneezer, a gray mouse with powerful sneezes; Concord Condor, a purple condor; Byron Basset, a usually sleeping basset hound; Bookworm, a green worm with glasses; Arnold the Pit Bull, a muscular white pit bull; Fowlmouth, a white rooster with horrid language; Barky Marky, a brown dog, and Mary Melody, a young African American human girl. Feeding off the characters are the more traditional Looney Tunes such as Bugs Bunny, Daffy Duck, and Porky Pig among others. Most of the adults teach classes at Acme Looniversity and serve as mentors to the Tiny Toons while others fill secondary positions as needed. The series and the show's characters were developed by series producer, head writer and cartoonist Tom Ruegger, division leader Jean MacCurdy, associate producer and artist Alfred Gimeno and story editor/writer Wayne Kaatz. Among the first writers on the series were Jim Reardon, Tom Minton, and Eddie Fitzgerald. The character and scenery designers included Alfred Gimeno, Ken Boyer, Dan Haskett, Karen Haskett, and many other artists and directors. The series was actually planned to be a feature film. Once Steven Spielberg was attached, numerous things changed, including the idea of turning the movie into a television series. "Buster and Babs Go To Hawaii" was co-written by three then-teenage girls who were fans of the show. Voice director Andrea Romano auditioned over 1,200 voices for the series and chose more than a dozen main voice actors. The role of Buster Bunny was given to Charlie Adler, who gave the role, as producer Tom Ruegger said, "a great deal of energy". The role of Babs Bunny was given to Tress MacNeille. Writer Paul Dini said that MacNeille was good for the role because she could do both Babs' voice and the voices of her impressions. Voice actors Joe Alaskey and Don Messick were given the roles of Plucky Duck and Hamton J. Pig, respectively. Danny Cooksey played Montana Max and, according to Paul Dini, was good for the role because he could do a "tremendous mean voice." Cooksey was also the only voice actor in the cast who was not an adult. Cree Summer played the roles of Elmyra Duff and Mary Melody; former Saturday Night Live cast member Gail Matthius played Shirley the Loon, and Kath Soucie had the roles of Fifi La Fume and Li'l Sneezer. Other actors for the series included Maurice LaMarche as the voice of Dizzy Devil; Candi Milo as the voice of Sweetie, Frank Welker as the voice of Gogo Dodo, Furrball, Byron Basset, Calamity Coyote, Little Beeper, Barky Marky, and other voices; and Rob Paulsen as the voice of Fowlmouth, Arnold the Pit Bull, Concord Condor, and other characters. The legendary voice behind the Looney Tunes, Mel Blanc, was set to reprise his roles as the classic characters, but died in July 1989. His characters were recast by the likes of Jeff Bergman, Joe Alaskey, Greg Burson, and Mel's son, Noel Blanc. During production of the series' third season, Charlie Adler left the show due to a conflict with the producers. Adler was upset that he had not landed a role in Animaniacs while voice actors with smaller roles in Tiny Toon Adventures like Rob Paulsen, Maurice LaMarche, and Frank Welker were given starring roles in the new series. John Kassir replaced Adler for the remainder of the show's run (although Adler would eventually return to voice Buster in the cancelled video game, Tiny Toon Adventures: Defenders of the Universe). Joe Alaskey, the voice of Plucky Duck, also left Tiny Toons for financial reasons, but returned when an agreement was reached with the studio. In order to complete 65 episodes for the first season, Warner Bros. Animation and Amblin Entertainment contracted several different North American and international animation houses. These animation studios included Tokyo Movie Shinsha (now known as TMS Entertainment), Wang Film Productions, AKOM, Freelance Animators New Zealand, Encore Cartoons, StarToons, and Kennedy Cartoons. Tokyo Movie Shinsha also animated the series' opening sequence. Some of the Warner Bros. staff disliked working with Kennedy Cartoons due to the animation studio's inconsistent quality, and episodes that they animated were often subject to multiple re-takes. In other cases, such as the debut episode "The Looney Beginning", portions of Kennedy Cartoons-animated episodes were re-animated by another animation studio. Kennedy Cartoons was actually dropped after the end of the series' first season. Tiny Toon Adventures was made with a higher production value than standard television animation. It had a cel count that was more than double that of most animated television shows then. The series had about 25,000 cels per episode instead of the standard 10,000, making it unique in that characters moved more fluidly. Pierre DeCelles, an animation producer, described storyboarding for the series as "fun but a big challenge because I always had a short schedule, and it's not always easy to work full blast nonstop". During the development of the show Steven Spielberg said that Warner Bros. would use a full orchestra, which some thought too expensive and impossible, but they ended up agreeing. Warner Bros. selected Bruce Broughton to write the theme tune (for which he would win a Daytime Emmy along with Tom Ruegger and Wayne Kaatz, who both worked with Broughton on the lyrics) and serve as music supervisor. Screen credits for the composers were given based on the amount of music composed for, or composed and reused in, the episode. Twenty-six other composers were contracted to create original dramatic underscore for each different episode during the series run: Julie and Steve Bernstein, Steven Bramson, Don Davis, John Debney, Ron Grant, Les Hooper, Carl Johnson, Elliot Kaplan, Arthur Kempel, Ralph Kessler, Albert Lloyd Olson, Hummie Mann, Dennis McCarthy, Joel McNeely, Peter Myers, Laurence Rosenthal, William Ross, Arthur B. Rubinstein, J. Eric Schmidt, David Slonaker, Fred Steiner, Morton Stevens, Richard Stone, Stephen James Taylor and Mark Watters. The composers conducted their own music. Of these composers, Broughton, Bramson, Davis, Olson, Stone, Taylor and Watters wrote the score to Tiny Toon Adventures: How I Spent My Vacation. A feature-length movie was released direct-to-video in 1992, entitled Tiny Toon Adventures: How I Spent My Vacation. This was later re-edited and aired as part of the series. The length of the movie is 73 minutes. Fox aired It's a Wonderful Tiny Toons Christmas Special in primetime on December 6, 1992. This episode is a parody of It’s a Wonderful Life. Although the Christmas episode is called a special it is only called this as it is Christmas themed and is just a regular episode. The Tiny Toon Spring Break Special was aired on Fox during primetime on March 27, 1994. Fox aired Tiny Toons' Night Ghoulery in primetime on May 28, 1995. In 1992, The Plucky Duck Show was produced as a spin-off for Fox Kids, based on the character Plucky Duck. Except for the premiere episode The Return of Batduck, the show was composed entirely of recycled Plucky-centric episodes from Tiny Toons. In 1998, a spin-off entitled Pinky, Elmyra & the Brain debuted on Kids' WB. This series featured the Elmyra character as well as Pinky and the Brain, two characters who were originally on Animaniacs before receiving their own series, also entitled Pinky and the Brain. Pinky, Elmyra & the Brain picks up after Pinky leaves off where Pinky and the Brain become Elmyra's pets after Brain accidentally destroys their original home, ACME Labs, during an experiment. Pinky, Elmyra & the Brain lasted for thirteen episodes. In January 2009, IGN named Tiny Toons as the 41st in their Top 100 Animated TV Shows list. Tiny Toon Adventures Magazine, a quarterly children's magazine based on the series, debuted in October 1990. Issues #1–4 were published by DC Comics, and issues #5–7 were released by Welsh Publishing Group. The final issue was cover dated Spring 1992. Also, various storybooks were published by the Little Golden Book company, including a few episode adaptations and some original stories (Lost in the Fun House and Happy Birthday, Babs!). Tiny Toon Adventures also had a comic book series made by Warner Bros. and DC. The characters also made occasional cameo appearances in the Animaniacs, Freakazoid and Pinky and the Brain comic books. Since its debut, numerous video games based on Tiny Toons have been released. There have been no less than nine titles based on the series released after its original television run and as recently as 2002. Many companies have held the development and publishing rights for the games, including Konami (during the 1990s), Atari, NewKidCo, Conspiracy Games, Warthog, Terraglyph Interactive Studios, and Treasure. Toys for the series included plush dolls and plastic figures, primarily made by Playskool. Tiny Toon Adventures: How I Spent My Vacation was released on DVD on August 21, 2012. There are currently no plans to release the two specials (Spring Break and Night Ghoulery) on DVD. In the early to mid-1990s, Warner Bros. had released several videos, including Tiny Toon Adventures: How I Spent My Vacation (a direct-to-video release which later aired as a four-part episode), Best of Buster and Babs, Two Tone Town, Tiny Toons: Big Adventures, Tiny Toons: Island Adventures, Tiny Toons: Music Television, Tiny Toons: Fiendishly Funny Adventures, Tiny Toons: Night Ghoulery and It's a Wonderful Tiny Toons Christmas Special. Season 1 Volume 1 35 July 29, 2008 (2008-07-29) From Looney Tunes to Tiny Toons: A Wacky Evolution, featurette Was released concurrently with the first season of Freakazoid. "The Looney Beginning" episode is uncut on the set. Season 1 Volume 2 30 April 21, 2009 (2009-04-21) None, aside from trailers. Was released concurrently with the second season of Freakazoid. Two episodes are edited: "Tiny Toons Music Television" (a phone number gag removed) and "Son of the Wacko World of Sports" (wraparounds and title cards removed). Volume 3: Crazy Crew Rescues 17 January 8, 2013 (2013-01-08) None, aside from trailers. The previously banned episode "Elephant Issues" is included in this set. Initially when the set was announced, the content list did not contain the episode due to its controversial "One Beer" segment. Volume 4: Looney Links 16 May 28, 2013 (2013-05-28) None, aside from trailers. The original release contained a glitch which Warner Bros. fixed by the end of July. Also, "Best of Buster Day" is missing its second wraparound scene. According to writer Paul Dini, Tiny Toons originated as an idea by Terry Semel, the then-president of Warner Bros., who wanted to "inject new life into the Warner Bros. Animation department," and at the same time create a series with junior versions of Looney Tunes characters. Semel proposed that the new series would be a show based on Looney Tunes where the characters were either young versions of the original Looney Tunes and Merrie Melodies characters or new characters as the offsprings of the original characters. The idea of a series with the basis of younger and junior versions of cartoon characters was common at the time; the era in which Tiny Toons was produced for had such cartoons as Muppet Babies, A Pup Named Scooby-Doo, Tom & Jerry Kids and The Flintstones Kids. Warner Bros. chose to do the same because Spielberg wanted to make a series similar to Looney Tunes, as series producer/show-runner Tom Ruegger explained: "Well, I think in Warner Bros. case, they had the opportunity to work with Steven Spielberg] on a project [...] But he didn't want to just work on characters that Chuck Jones, Friz Freleng, Bob McKimson and Bob Clampett made famous and created. He wanted to be involved with the creation of some new characters." The result was a series similar to Looney Tunes without the use of the same characters. On January 20, 1987, the Warner Bros. Animation studio approached Steven Spielberg to collaborate with Semel and Warner Bros. head of licensing Dan Romanelli on Semel's ideas. They eventually decided that the new characters would be similar to the Looney Tunes characters with no direct relation. However, Tiny Toons did not go into production then, nor was it even planned to be made for television; the series initially was to be a theatrical feature-length film. On December 27, 1988, Tiny Toons was changed from a film to a television series, with Jean MacCurdy overseeing production of the first 65 episodes. MacCurdy said that Tiny Toons was changed to a television series to "reach a broader audience". For the series, MacCurdy hired Tom Ruegger, who previously wrote cartoons for Filmation and Hanna-Barbera, to be a producer. In January 1989, Ruegger and writer Wayne Kaatz began developing the characters and the setting of "Acme Acres" with Spielberg. On January 9, 1989, Warner Bros. Animation was choosing its voice actors from over 1,200 auditions and putting together its 100-person production staff. On April 13, 1989, full production of series episodes began with five overseas animation houses and a total budget of $25 million. The first 65 episodes of the series aired in syndication on 135 stations, beginning in September 1990. During that time, Tiny Toons was a huge success and got higher ratings than its Disney Afternoon competitors in some affiliates. After a successful run in syndication, Fox attained the rights for season 3. Production of the series halted in late 1992 to make way for Animaniacs to air the following year. Tiny Toon Adventures, along with Animaniacs, continued to rerun in syndication through the 1990s into the mid-2000s (decade) after production of new episodes ceased. In the United States, the series re-ran on Nickelodeon from 1995–1999 and again from 2002–2004, and also aired on Kids' WB from 1997–2000, Cartoon Network from 1999–2001 and finally on Nicktoons from 2002–2005. On October 27, 2012, the series aired on broadcast television once again on Vortexx with the special "Tiny Toons' Night Ghoulery" and again on November 24, 2012. The series began airing re-runs on the Hub Network on July 1, 2013. Tiny Toon Adventures was one of the few shows carried over when the Hub Network was re-branded as the Discovery Family on October 13, 2014. Discovery Family stopped airing reruns of Tiny Toon Adventures in early 2015. Tiny Toon Adventures returned to Discovery Family on June 6, 2015, but was removed again shortly after. 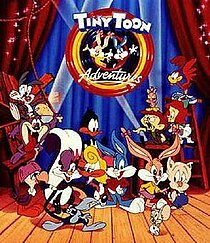 On January 4, 2018, Hulu acquired the streaming rights to Tiny Toon Adventures along with Pinky And The Brain, Animaniacs, & Pinky, Elmyra and the Brain. ^ Trusdell, Brian (May 28, 1995). "Focus : Warner's Toon Factory for the 1990s". The Los Angeles Times. USA. Retrieved 10 May 2011. ^ "TV Listings for - September 14, 1990 - TV Tango". TV Tango. Retrieved 10 May 2011. ^ a b Mendoza, N.F. (March 27, 1994). "SHOWS FOR YOUNGSTERS AND THEIR PARENTS TOO : Spielberg's 'Tiny Toons' break for prime time and the rites of spring". The Los Angeles Times. USA. Retrieved 10 May 2011. ^ Berkman, Meredith (February 1, 1991). "Adventures among the 'Toons'". Entertainment Weekly issue #51. USA. Retrieved 28 May 2011. ^ a b c d e Lambert, David (September 9, 2012). "Tiny Toon Adventures - Long-Awaited 'Volume 3' DVD Brings Toons from 2nd, 3rd Season". TV Shows on DVD. Archived from the original on September 29, 2012. Retrieved September 28, 2012. ^ a b c d e f g h i j k l Miller, Bob (1990). "NEW TOONS ON THE BLOCK: They're attending Acme Looniversity & hoping to graduate as classic cartoon characters". Comic Scene (15). pp. 33–39, 68. ^ Owens, John (July 5, 1992). "Drawing On Experience". Chicago Tribune. Retrieved 1 October 2011. ^ Lenburg, p. 336. Retrieved 2007-06-27. ^ "Tiny Toon Adventures: How I Spent My Vacation". The Internet Movie Database. IMDb. Retrieved March 22, 2011. ^ "TV Listings for - December 6, 1992 - TV Tango". TV Tango. Retrieved 10 May 2011. ^ "Tiny Toons Spring Break". The Internet Movie Database. IMDb. Retrieved March 22, 2011. ^ "TV Listings for - March 27, 1994 - TV Tango". TV Tango. Retrieved 10 May 2011. ^ "Tiny Toons' Night Ghoulery". The Internet Movie Database. IMDb. Retrieved March 22, 2011. ^ "TV Listings for - May 28, 1995 - TV Tango". TV Tango. Retrieved 10 May 2011. ^ a b c d "Awards for "Tiny Toon Adventures"". The Internet Movie Database. Retrieved 2007-06-02. ^ a b c d e f g h "Awards for 'Tiny Toon Adventures'". The Internet Movie Database. IMDb. Retrieved March 22, 2011. ^ "Twelfth Annual Youth in Film Awards: 1989–1990". The Young Artist Foundation. Retrieved 2007-06-02. ^ "Fourteenth Annual Youth in Film Awards: 1991–1992". The Young Artist Foundation. Retrieved 2007-06-02. ^ "Video Games, Wikis, Cheats, Walkthroughs, Reviews, News & Videos - IGN". Tv.ign.com. Archived from the original on 2009-02-11. Retrieved 2016-09-10. ^ "Tiny Toon Adventures DVD news: Missing episode, 'Elephant Issues,' to be included!". TVShowsOnDVD.com. 2013-01-08. Archived from the original on 2016-05-03. Retrieved 2016-09-10. ^ "SUFFERIN' SUCCOTASH! IT'S LOONEY TUNES, TAKE TWO". Entertainment Weekly. September 28, 1990. ^ Lenburg, p. 336. Retrieved 2007-11-15. ^ Petski, Denise (4 January 2018). "'Animaniacs' Reboot Gets Two-Season Straight-To-Series Order At Hulu". Deadline. Retrieved 4 January 2018. Lenburg, Jeff (1999). "Specials". The Encyclopedia of Animated Cartoons (Second ed.). New York, New York: Checkmark Books. pp. 336–337. ISBN 0-8160-3831-7. Lenburg, Jeff (1999). "Steven Spielberg Presents Tiny Toon Adventures [Television Series]". The Encyclopedia of Animated Cartoons (Second ed.). New York, New York: Checkmark Books. p. 521. ISBN 0-8160-3831-7. Tiny Toon Adventures at Don Markstein's Toonopedia. Archived from the original on December 7, 2017.